First, let’s welcome the newest pledges of Tau Omega Sigma! They’ve endured all manner of torment to get here, but now they stand together, united as sisters. And in case you think it’s another sorority hazing ritual that the queen bee and two of these pledges have wound up in jail, nope. I blame the alcohol. And underage drinking. And fleeing a crime scene. And backing into a police cruiser. You get the idea. Gulp! Boy, did they pick the wrong night to get tossed in the clink. Their cell is just down the hall from notorious serial killer Doyle Macmaran (Kevin Gage), who’d rather rot behind bars than reveal to investigators where he buried the remains of his countless teenaged victims. Oh, right, and the detention center also has a couple trucksful of dinosaurs down below. You see, the top-secret government research facility where cloned raptors are traditionally housed has been compromised, so… prison! Why not? Besides, the warden (Ray Wise) owes Agent LaFranco (Vernon Wells) a favor. Look, you already know what happens next. Doyle relents, at long last allowing all these grieving parents a chance to properly bury their missing daughters. The ladies of Tau Omega Sigma are bailed out by their folks, having learned a very valuable lesson from their night in jail. And those dinosaur clones are picked up by the Department of Interior Homeland Security – which is totally not made up – and safely transported to a secure facility. Whew! I’d tell you I’m kidding, but I guess the multiple screenshots of dinosaurs eating people clued you in already. The jail is quickly overrun by raptors. The sorority girls reluctantly band together with a junkie, a handsy alpha lesbian and her moll, a couple of Otis the Town Drunk types, a wounded guard, and a serial killer. Spoilers: Not all of them will make it out alive. More spoilers: The dinosaurs aren’t the only murderous monsters they’ll be pitted against. If you’re wondering why the movie’s called Jurassic City rather than Jurassic Detention Center, it occasionally cuts to a B-plot with raptors running rampant in suburban Los Angeles. In the first few minutes alone, you’re treated to a raptor attack, septuagenarian Australian treasure Vernon Wells (The Road Warrior; Circuitry Man), a dinosaur-gone-boom courtesy of a grenade launcher, and a couple of bikini-clad sorority girls wrestling in an bubble bath-slash-inflatable pool. 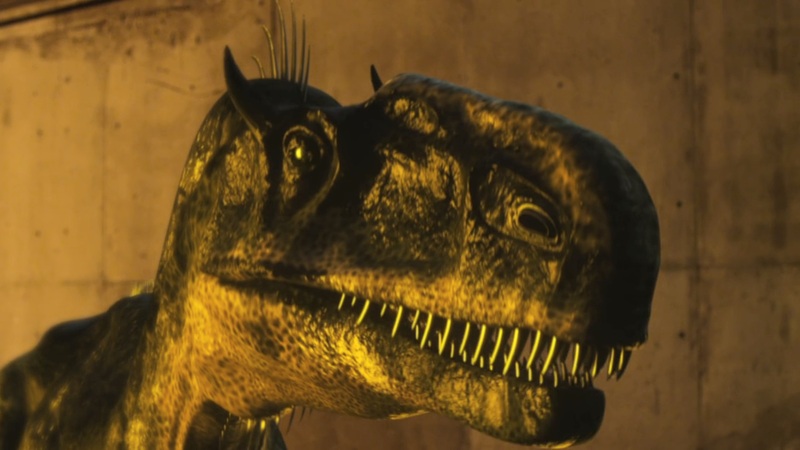 Jurassic City may only have one dinosaur CG model for just about the entirety of the movie, with low-res textures, inconsistent lighting, and a jarringly clunky frame rate. What it lacks in an effects budget, it does its damndest to compensate for with pretty ladies in swimsuits at every conceivable opportunity. Look, if you feel like poking fun at Jurassic City, it supplies you with all the ammunition you need. 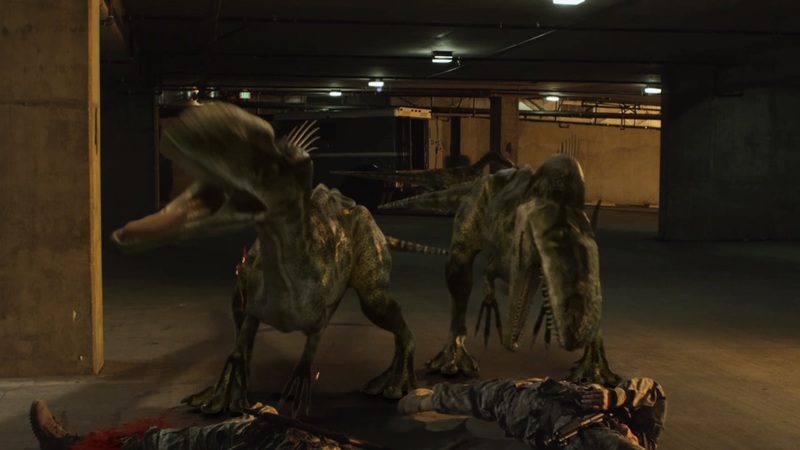 Take the actress who seems like she’s supposed to be keeping a watchful eye on a raptor as she slinks out of the command center, only her eyeline is miles off from where the VFX ended up. The sinister master plan – and you better believe there’s a sinister master plan – betrays a fundamental lack of knowledge about the requirements to become President of these United States. Maybe the idea is that the Constitution gets tossed out in the dinopocalypse? I dunno. Doesn’t really matter. What I’m getting at is that Jurassic City is exactly the movie it sets out to be. It’s unapologetically ridiculous. The pacing consistently breezes along, steering clear of the dull stretches that so often drag down these sorts of movies. You’re treated to Ray Wise wielding an assault rifle and a golden, glowing bunny hallucination. Lines like “I can’t leave my wolf sister!” are delivered with startling sincerity. Even though you can spot the inevitable betrayals, gallant sacrifices, and the Final Girl archetype from a mile away, I really like the cast. Aside from the familiar faces mentioned earlier, Jurassic City also features iconic that guy Robert LaSardo, Skinemax mainstay Monique Parent, the guy who played the silhouette of Superman in the first season of Supergirl, and Felissa Rose of Sleepaway Camp infamy. Dana Melanie is a particular standout as reluctant sorority pledge Pippi, whose diminutive frame hides a mighty heroine. Jurassic City has clawed its way to Blu-ray in Germany and Hong Kong, but alas, no such luck on these shores. At least it’s streaming on Amazon at no additional charge to Prime subscribers. I think I remember this trash. I really enjoyed it, despite its cheeze quality. Well, at least Ray Wise’s contributions were not overlooked during your visit to Jurassic City — wielding an assault rifle is a skil that his work rarely affords the opportunity to utilize. Germany, Hong Kong and US Amazon Prime members will be envied by fans of Ray unable to enjoy a trip to Jurassic City and settle for an episode of ABC’s Fresh Off The Boat.